Large-scale climatic variability has been implicated in the population dynamics of many vertebrates throughout the Northern Hemisphere, but has not been demonstrated to directly influence dynamics at multiple trophic levels of any single system. Using data from Isle Royale, USA, comprising time series on the long-term dynamics at three trophic levels (wolves, moose, and balsam fir), we analyzed the relative contributions of density dependence, inter-specific interactions, and climate to the dynamics of each level of the community. Despite differences in dynamic complexity among the predator, herbivore, and vegetation levels, large-scale climatic variability influenced dynamics directly at all three levels. The strength of the climatic influence on dynamics was, however, strongest at the top and bottom trophic levels, where density dependence was weakest. Because of the conflicting influences of environmental variability and intrinsic processes on population stability, a direct influence of climate on the dynamics at all three levels suggests that climate change may alter stability of this community. Theoretical considerations suggest that if it does, such alteration is most likely to result from changes in stability at the top or bottom trophic levels, where the influence of climate was strongest. Early recognition of the contrast between the stabilizing influences of density-dependent population regulation, and potentially de-stabilizing influences of environmental variation , laid a foundation for theoretical modeling of population stability in stochastic environments  that assumes renewed relevance in light of current developments in ecology and climate research . Recently, for instance, numerous studies have documented the influences of global-scale climatic variation on the population dynamics of vertebrates in widely diverse ecosystems (see, e.g., [4, 5] for reviews), including species interactions at the community level [6–8]. To our knowledge, however, no study has yet documented a simultaneous and direct influence of large-scale climate on the dynamics at all trophic levels in a single system. Such a pervasive influence could pose consequences for the persistence of biological communities if the climatic influence at any trophic level (or multiple levels) were strong enough to alter its dynamical stability . Here, we use empirical data on a three-trophic level system involving predators, herbivores, and vegetation, and a community-level model, to test for the influences of climate on the dynamics at and among individual trophic levels, while simultaneously accounting for the roles of intrinsic (density-dependent) and interspecific interactions. Previously, we identified correlations between large-scale variation in winter climate, the North Atlantic Oscillation (NAO) , and: predation efficiency of wolves (Canis lupus), mortality of old moose (Alces alces), and growth dynamics of balsam fir (Abies balsamea) on Isle Royale . Additionally, we have documented influences of the NAO, wolf predation, and density dependence on the intrinsic rate of increase in the moose population on Isle Royale . Hence, the current analysis was motivated by the results of these earlier attempts to dissect the relative contributions of intrinsic and extrinsic processes to the dynamics of this community, as well as by a more general interest in developing a community-level model of climatic effects at and among multiple trophic levels that may subsequently contribute to our understanding of the implications of climatic change for community stability. Quantifying the role of climatic variation in the dynamics at multiple trophic levels requires, however, a modeling framework that first accounts for the influence of interspecific and intrinsic processes on the dynamical structure at each level, so that the influence of intrinsic processes on the autoregressive (AR) structure of the time series data is not mistaken for a lagged influence of environmental stochasticity . Based on the approach used in the development of previous bivariate population models [12–14], we developed and applied a model testing for the direct influence of large-scale climate on the dynamics at individual trophic levels and interactions among levels (Figure 1). This graphical model was used to express mathematically the predicted autoregressive structure of the time series data at each level on the basis of interspecific density interactions at adjacent trophic levels , as well as the time lags at which climate might influence dynamics at each level (see equations (1-4) in Methods, below). The time series we analyzed comprise 30 years of data (1958–88) from the monitoring study on Isle Royale on the population dynamics of wolves and moose, and interannual variability in growth increments of balsam fir [6, 15, 16]. Though the data extend to the present, estimates of moose density beyond 1988 have not been adjusted by cohort reconstruction (see ref. ), so we constrained our analysis to the first 3 decades. The process-oriented ecological model of intra- and inter-trophic level dynamics in a simple, straight-chain community, based on empirical observations of interactions between wolves, moose, balsam fir, and climate on Isle Royale, USA. The effect of the herbivore on vegetation is specified as a current-year effect, but is likely to operate at a minimum lag of 3–6 months. 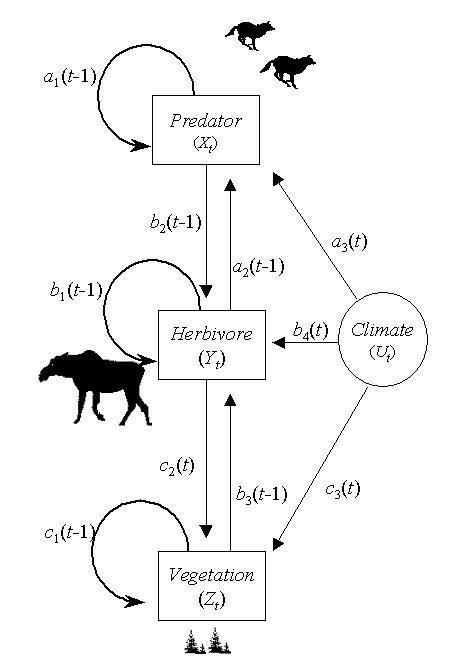 In equations (2) of the Methods section, the climate term U is partitioned into the strictly direct influence of climate, U D , and the indirect influence that is reflected in prey vulnerability to predation, U P . In this scenario, climate may directly influence survival of wolves and/or moose, and hence changes in their numbers, from the beginning of winter to the end of winter. Similarly, climatic influences on the susceptibility of moose to predation may result in changes in the numbers of wolves and/or moose from the beginning to the end of winter. Partitioning of the climate term U into direct and indirect effects was achieved by setting U t = U Dt + U Pt , where U Dt is the NAO winter index in the current year, and U Pt is wolf pack size in the current winter. Note that this current year effect is actually a 3–4 month lagged effect, because it quantifies the influence of winter conditions from December–February on wolf predation and survival, and on moose survival, that may influence changes in estimates of wolf and moose density made at the end of winter. The corrected Akaike Information Criterion (AIC c )  scores of the pure time series data at each level of the Isle Royale community indicate that the AR dimension of the data for the period 1958–88 is one for wolves, three for moose, and one for fir. AIC c scores of the first, second, and third order autoregressive models [i.e., AR(1), AR(2), and AR(3)] are, for wolves 4.2, 7.1, 10.6; for moose -64.6, -63.9, -67.1; and for balsam fir -26.0, -22.1, -21.6. The lowest AIC c score indicates the most parsimonious dimension at each trophic level. In full agreement with the pure AR structure of the time series, the most parsimonious ecological model of wolf dynamics was an AR(1) model with current-year climate as a covariate (Table 1a); the best model of moose dynamics was an AR(3) model with current-year climate as a covariate (Table 1b); and the best model of fir dynamics was an AR(1) model with current-year climate as a covariate (Table 1c). Each of these models provided a good approximation of the dynamics at the individual trophic levels (Table 1; Figure 2). Note, however, that for moose a good approximation of the dynamics was afforded by an AR(2) model with the same covariates as the best AR(3) model in Table 1 (R2 = 0.96, AIC c = -63.9), and so might be favored over the AR(3) model on the basis of parsimony. Observed time series data (dots) on interannual dynamics of (A) wolves, (B) moose, and (C) balsam fir on Isle Royale, 1958–88; and best-fit autoregressive models at each trophic level (see Table 1), shown as one-step-ahead predicted values (solid lines) and 95% confidence intervals (dashed lines). Goodness-of-fit measures for each of the models are given in Table 1. 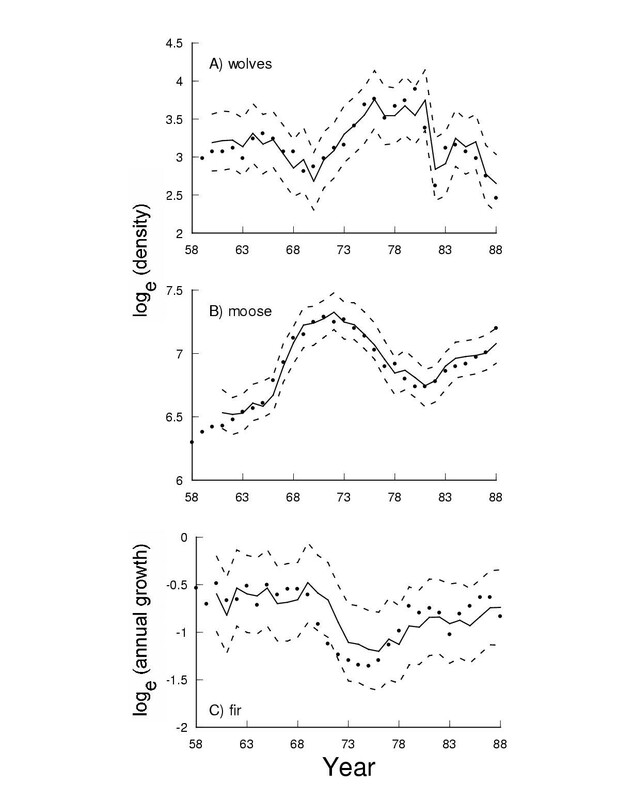 The statistical models of the dynamics at three trophic levels on Isle Royale, USA, 1958–88. The first model given at each trophic level is the full model, showing the autoregressive structure of the time series and co-variates expected to be significant if the relationships depicted in the process-oriented ecological model in Figure 1 are all important. AIC c is the corrected Akaike Information Criterion score; bold type indicates the most parsimonious model. 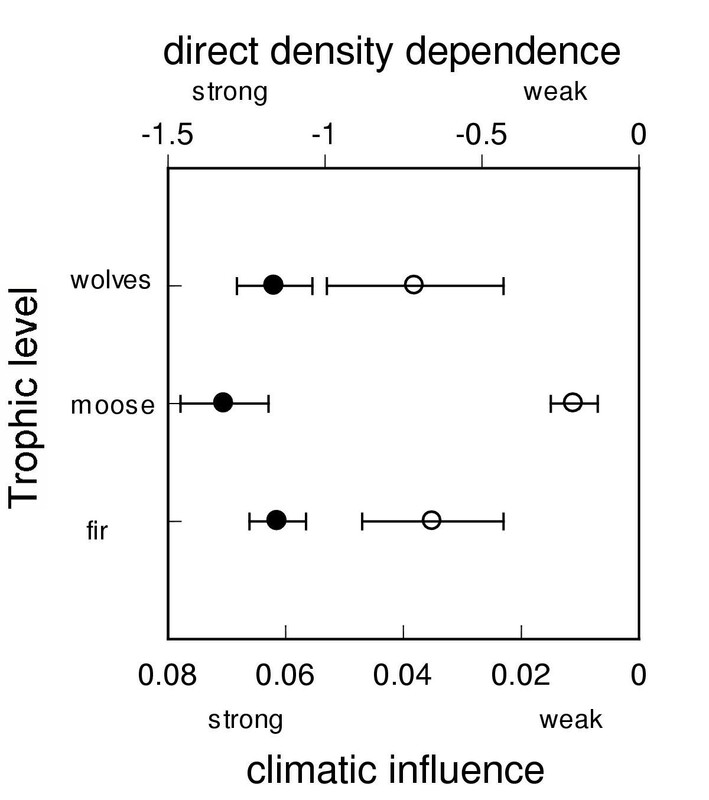 Direct density dependence was slightly stronger at the middle trophic level (moose) than at the top or bottom levels, though none of the tests for differences between these coefficients was significant (Figure 3). In contrast, the influence of large-scale climate was significantly weaker at the middle trophic level than at either the top or bottom trophic levels (Figure 3). Coefficients of direct density dependence (solid circles) and direct climatic influence of the North Atlantic Oscillation (open circles) on the dynamics at individual trophic levels on Isle Royale, USA (1958–88). Bars indicate ± 1 SE. Note that the coefficient of direct density dependence at each trophic level includes a constant that reflects the predicted dimension of the time series at that level (see equations  and, e.g., ref. []); these constants were subtracted for the purpose of comparing the strength of statistical direct density dependence among levels. Results for Welch's approximation of the t-test for coefficients with heterogeneous variances  were, for direct density dependence: wolf vs. moose t0.05,48 = 0.87, P > 0.50; moose vs. fir t0.05,52 = 1.02, P = 0.30; wolf vs. fir t0.05,52 = 0.07, P > 0.50; and, for direct climatic influence: wolf vs. moose t0.05,48 = 1.67, P = 0.05; moose vs. fir t0.05,52 = 1.97, P = 0.02; and wolf vs. fir t0.05,52 = 0.15, P > 0.50. The results of our analysis corroborate previous observations of the limiting influences of winter climate in moose population dynamics , of the mediating influence of winter climate in wolf-moose interactions , of the roles of wolf predation and density dependence in moose dynamics [10, 20], and of the direct influence of winter climate on growth dynamics of balsam fir  on Isle Royale. To our knowledge, however, this study constitutes the first documentation of direct and simultaneous influences of large-scale climate on the dynamics at multiple trophic levels in a single system. Although many studies have documented influences of winter weather, particularly snow conditions, on wolf-prey interactions (e.g., [19, 21–23], we are unaware of studies showing an influence of winter climate on wolf population dynamics. Evidence of influences of snow on wolf movement, social tendencies  and predation rates  suggests, however, that winter climate might affect wolf survival. While we wish to avoid speculating as to potential mechanisms underlying the direct influence of the NAO on wolf dynamics indicated by our analysis (Table 1), it may be worth considering that residual variation in annual wolf mortality, after accounting for the influences of wolf density and pack size , correlates negatively with the current-year NAO index (standardized r = -0.52, t = 2.22, P = 0.038). Trophic theory , statistical ecology [26, 27], and our model (Figure 1 and equation (4) in Methods) predict that the embedding dimension (i.e., the number of time lags we must look back upon in order to find a correlation with the current year's density) of the dynamics at each trophic level should reflect the number of species influencing the dynamics at each level, as several recent analyses have also demonstrated [14, 28, 29]. In this perspective, we found, however, lower dimension (i.e., first-order) at both the predator and vegetation levels than expected (Table 1), while dynamics at the herbivore level displayed the higher dimension predicted by our model. Interestingly, dimensionality in this large-mammal system parallels the dynamic structure of the lynx-hare system of the Canadian boreal forest at the herbivore level, but not at the predator level . The embedding dimension of lynx, which are affected by many species other than snowshoe hare across the boreal forest of Canada, is generally two or higher [28, 30]. The contrasting simplicity of wolf dynamics on Isle Royale reflects, we suggest, the comparatively insular nature of the Isle Royale system and relative scarcity of additional species influencing the dynamics of wolves there . Despite having low dimension, the top and bottom trophic levels displayed complex dynamics (Table 1). Indeed, spectral analysis of the wolf and moose time series reveals significant periodicity at both levels that is apparently driven by phase-dependent predation, a process that is endogenous to wolf dynamics but exogenous to moose (E. Post, N.C. Stenseth, R.O. Peterson, J.A. Vucetich, A.M. Ellis, in review). Fir dynamics on Isle Royale are, moreover, tightly linked with changes in moose density [6, 16], which could contribute to exogenously generated periodicity at that level . The low dimension of the dynamics at the top and bottom trophic levels masks, in a sense, interactions with the adjacent (herbivore) level that were captured in these models. Note, however, that in the most parsimonious model of wolf dynamics (Table 1), the lag-one autoregressive term quantifying direct density dependence includes the coefficient of self-regulation in moose (1 + b1), and the coefficient of the lag-one pack size term includes the coefficient quantifying the interaction between moose density and wolf density (coefficient a2 from Equation 2a). As well, in the most parsimonious model of fir dynamics (Table 1), the lag-one autoregressive term includes the coefficients quantifying the influences of moose on fir (coefficient c2 from equation 2c) and of fir on moose (coefficient b3 from equation 2b). Hence, an important conclusion of this analysis is that while interactions between adjacent trophic levels lead to predictions of higher-order dynamics during the derivation of the community model (Figure 1), the act of following the coefficients from the individual trophic-level models (sensu) allows us to observe that trophic interactions may also appear in first-order density dependence. Experimental evidence from microcosm studies indicates that climatic change may alter community stability if individual populations composing the community exhibit weak density dependence, or if climate change influences interspecific interactions . While we caution against drawing general conclusions from this analysis, our results suggest that climatic change has the potential to influence the stability of this community by altering the dynamics and stability at any single, or all three, of the individual trophic levels. Because self-regulation (i.e., direct density dependence) was relatively weaker at the top and bottom trophic levels (though not significant statistically), it may be these levels at which climate change alters stability of the community. It is worth recalling, however, that theory predicts that population stability depends on the relative strengths of intrinsic and environmental influences on population dynamics . In this regard, it may be the observation that climate exerted its greatest influence on the dynamics of the top and bottom trophic levels (Figure 3) that is most relevant because, even if self regulation were equivalent at all three levels, it is at the levels most responsive to climate where we will see the greatest effects of climate change on dynamics and stability . Moreover, it appears that in this system, the two trophic levels with the simplest dynamics (predator and vegetation) also displayed the greatest response to climate. Whether community stability in a changing climate relates to dynamic complexity at individual trophic levels, as opposed to complexity of entire food webs (sensu), should prove to be a fruitful and important pursuit in future research. where X t , Y t and Z t are the log e -transformed P t , H t and Z t , respectively, and where U Dt is a climate variable (here, U Dt is the NAO winter index; see ), and where U Pt represents wolf pack size, which correlates with winter climatic conditions and pack kill rate (moose killed/pack/day) , and which incorporates social structure and associated non-predatory behavior that could affect dynamics of both wolves  and moose . We used the full model framework (equations 4) to identify the most parsimonious model of the dynamics at each trophic level. Beginning with the full model at each trophic level, we used autoregressive analysis with maximum likelihood estimation and backwards elimination of non-significant covariates and lagged autoregressive terms to arrive at reduced models that minimized the corrected Akaike Information Criterion (AIC c ) . We considered changes in the AIC c scores of less than one to be insignificant improvement of the models [37, 39]. We thank Rolf O. Peterson, John A. Vucetich, and Nils Chr. Stenseth, and an anonymous referee for helpful discussions and comments. E. P. acknowledges the financial support of NSF (grant #DEB-0124031) and the Department of Biology and the Environmental Consortium at Penn State University. M. C. F. acknowledges the financial support of the Danish Ministry of Research.